Much of the following material regarding Josh Fox’s Gasland fairy tale world has appeared previously on an earlier version of NaturalGasNOW.org and on the Energy In Depth – Marcellus website but is updated here as a refresher course for those following Gasland Part II. Founded in 1996 by a group of theatre and dance artists from Thailand, Indonesia, Japan, and the US, International WOW Company has created over 40 new plays, consistently lauded as ambitious, inventive, and visually stunning. The company develops works that position community and culture in an international context and redefine the dramatic event in the changing landscape of globalization. Over the past 8 years, International WOW has become a pioneer of international theatre exchange, incorporating performance methods from the East and West, and forging an interdisciplinary training for actors. What does all this mean? Well, apparently, it means productions such as Limitless Joy, described on the Fox website as “A dance-theater epic focusing on the origins of our species’ voracious desire.” A New York Times theater review entitled “Apocalyptic Vignettes, Violent Yet Intimate,” said it was “limitless, all right… a muddled three-hour epic … of surrealistic, often wordless, visions, some lighthearted, some sensual … When a trapdoor opens, so many fresh-faced actors, in various states of undress, emerge that it reminds you of a clown car.” Fox and friends promoted ticket sales by saying “International WOW invites you to … a massive tomato fight where audience members are encouraged to throw their own tomatoes; to underwater scenes where dancers covered in chocolate pudding narrowly escape from shadow-puppet sharks.” Fun for all! Revealingly, in his comments on the Cinevegas.com blog, Fox says “Everything in the film was planned, every scene was either scripted or outlined beforehand – but everything really happened, because it was real, in a sense, we were immersed in that reality.” This notion that fake is real is, of course, what totally pervades Gasland and makes it the fairy tale it is. That Gasland was fakery is evident from his interview with Jon Stewart on the Daily Show, where he began by stating he got involved because he was offered $100,000 by a gas company to sign a lease for his 19.5 acre property in Milanville, Pennsylvania. Although he later corrected himself to say it was actually his father’s land, he let stand the claim he was offered what was over $5,000 per acre to sign, when every record of other such transactions indicates the highest price received by anyone signing leases in this area was slightly over half that amount or about $2,500. In a PBS interview he says it was $4,750 per acre, so maybe he was off a bit with Stewart. Regardless, Fox’s father was one tough negotiator. Or, was this a case of wishing for $5,000 per acre and not getting it? To ask the question is to answer it. Fox is immersed in imagination, not reality. Fox further asserts the Delaware River has been “protected” from gas drilling since 1972, never indicating exactly what he was talking about, but suggesting the Upper Delaware Scenic and Recreational River designation (made in 1979) prohibited gas drilling, which is anything but true. Indeed, the River Management Plan specifically provides for “oil & gas fields” in both Scenic and Recreational river segments. The Land and Water Use Guidelines (of which I was the primary author), moreover, state “new major oil and gas transmission lines and refining/production facilities for other than local service will not be located within the river corridor excepting for individual wells (subject to conditional use review), lines constructed from individual customers or wells. This does not prohibit maintenance of existing facilities or the location of new lines within existing rights-of-way.” So much for Fox’s legal interpretations, which, once gain, demonstrate a disconnect with reality and immersion in imagination. And, then there was that famous flaming faucet hyped in every movie trailer and politically correct television interview about Gasland. Viewers were startled when water from a faucet seemed to burn and, of course, natural gas drilling and fracking of wells was blamed. But, the very place where Fox filmed one of these episodes had been investigated before he filmed and the State of Colorado found “naturally occurring biogenic methane gas in the well and no impact from O&G (oil and gas) operations.” Phelim McAleer exposed that bit of deceit, of course, but it didn’t stop Fox from try to repeat in Gasland Part II with a similar false claim about a flaming hose in Texas, which was also identified as a fraud before the movie was released. Problems such as this pervade Gasland and Gasland Part II. One only has to read Gasland Debunked and Debunking Gasland Part II to see them. But who is behind this effort to convert Fox from the “badboy wunderkind director” into the innocent filmmaker who was shocked by what he learned and became determined to crusade against the evil empire? Well, we learn from the film credits and an article at LoHudson.com that actress Debra Winger was “deeply involved” with Gasland. She owns a home in Fremont Center, NY. The article states “Josh Fox, the director and star of ‘Gasland,’ contacted the actress for advice, and she jumped at the chance to become involved in getting Fox’s message to a wider audience. She even consulted with her friend and “Legal Eagles” co-star Robert Redford, since Redford has been successful in warding off gas drillers in Utah.” Robert Redford, of course, is the founder of the Sundance Film Festival that gave Gasland an award. The Gasland fairy tale takes shape. Then, there is the Park Foundation, which as funded Gasland and its sequel to the tune of $300,000 to date. And, who showed up the original HBO screening of Gasland in Manhattan? Well, not only Debra Winger, but also Senior Attorney Kate Sinding of the Natural Resources Defense Council (NRDC), the force behind the Catskill Mountainkeeper, where NRDC founder John Adam’s son Ramsey is the Executive Director. Ramsey also appeared at the gala June 17 screening. Robert Redford is an NRDC Trustees. So is John Adams, who earned $640,188 in compensation in 2005, as NRDC’s President. He serves, too, on the Boards of the Catskill Mountainkeeper and Delaware Riverkeeper, all these organizations having relationships and overlapping memberships. Gasland has been aggressively promoted by each. Environmental hysteria is apparently very profitable. It allows its purveyors to make huge salaries dwarfing those of ordinary residents of the region, while also presenting themselves as the righteous and selfless coming to the rescue of those residents. Meanwhile, the bad boy director Fox gets new found respect, tons of free publicity and a chance to hob-nob with the rich and famous. As the Playgoer blog notes; “what does a downtown director have to do to get on national TV? Make an HBO muckraking documentary, of course!” That’s what Gasland is all about; fame, money and prestige for a very few people who travel in small circles under different names. The losers are the local residents looking for the economic opportunities that responsible natural gas drilling might deliver. But, for Fox and friends that’s irrelevant, because it’s all about them. That’s the real fairy tale. 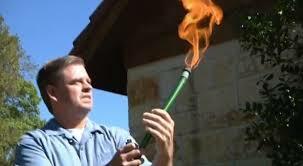 Correction – the flaming faucet in Parker Texas is quite real. Excuse me, but the court found it was fraudulent, so unless you have some superior knowledge the court didn’t have you are quite wrong. It was another flagrant lie.